During his three years at Arkansas State University, the late Barry Don Weyer Jr. dedicated countless hours to Red Wolves football as the team’s equipment manager. 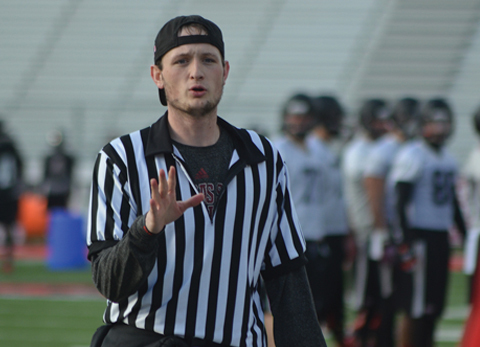 After spring practices were finished in 2014, Barry Don was thrilled to learn he’d been promoted to student assistant coach for student teams. He never got to serve in this role, however; on June 2, 2014, Barry Don’s life was tragically cut short as the result of a car crash in Paragould. His parents, Barry and Mechelle Weyer, along with their family and friends, have chosen to honor his memory through a scholarship. Each year the Barry Weyer Jr. Endowment Fund awards a scholarship to an equipment manager of any A-State sport. Barry and Mechelle are raising money for the Barry Weyer Jr. Endowment Fund with hopes of one day being able to give bigger scholarships to hardworking A-State equipment managers: students who show the same dedication and passion they saw in their son, Barry Don Jr. The Barry Weyer Jr. Endowment Fund will host its second annual Barry Weyer Jr. 5K on April 6. The Weyers hope to raise at least $6,000 with this event – enough to make the scholarship an endowment at Arkansas State University to honor Barry Don for years to come. Why did you choose to honor your son’s memory in this way? Barry Sr.: The way that this came about was actually out of an act of kindness. In 2014, when Markel Owens and Barry Don both passed away, Hoppy and Sheila Hoffman from The Design Shoppe started selling T-shirts with a cross on the front and each boy’s initials on the cross. They split the money made and started a scholarship in the name of each. Scholarships only last as long as the money is there, so we started raising money so that it would be around longer than a year. When the Alumni Association noticed how well we were doing, they offered us the opportunity to make it an endowment. The endowment is something that will hold his memory at ASU forever. How could we refuse that? So, we began the five-year journey to raising $25,000 for the endowment. We have just started our fourth year, and we are almost there. What kind of person was your son, Barry Don? What was important to him? Barry Sr.: Barry Don was a great kid, but I might be just a little biased. He was your typical college student. He was a Christian, he was very outgoing, he loved talking to people and meeting people. He loved life. He played football at Greene County Tech High School, and his senior year in 2012, he had a career-ending knee injury. He started working towards academic scholarships and picked up a couple. My wife, Mechelle, received an email about an opportunity for incoming freshmen at ASU to be equipment managers for the football team. I took him to the meeting, and he got the practice schedule for that spring. He was very determined to get the job, because he loved football and he wanted the financial help for school. Not knowing what would happen, he would get up at 4:30 in the morning and go to ASU, work with the team until about 7 a.m., then drive back to school in Paragould, then back to ASU in the afternoon. He also helped with summer workouts and 7 on 7 camps, all on a volunteer basis. Can you tell me about the scholarship application and selection process? Barry Sr.: The scholarship will be for an equipment manager, sophomore or higher, with at least a 3.0 GPA. The head coach of the sport will nominate the individual. The person nominated will write a letter stating their education goals. The Alumni Association and the athletic director will narrow down the field, then Mechelle and I will help pick the recipient. The Barry Weyer Jr. 5K will be held on April 6 at 8 a.m. Check-in will begin in the Brookland High School gym lobby at 6:45 a.m. Registration cost is $30, which includes a T-shirt. Trophies will be awarded to all age groups, with overall male and female winners, as well. To register, find the event on Facebook or stearnsracetiming.com. To donate directly to the Barry Weyer Jr. Scholarship Fund, find it on Facebook or mail a donation to Arkansas State University Foundation Inc., P.O. Box 1990, State University, AR, 72467-1990 and write “Barry Weyer Jr. Scholarship” in the memo line.